6000 sq ft Victorian Retreat. *Our guests love the well stocked, full service kitchen--Small appliances include 2 crock pots, blender, toaster, griddle & waffle maker. We, of course, have a coffee maker, lots of pots and pans, roasters, baking pans, plates, glasses, cups, serving bowls, serving utensils (*pizza cutter and wine bottle opener) and silverware. Spices, oil, coffee filters, napkins & other paper products are provided, as well as dish soaps, dish cloths & towels. *There are 5 comfortable bedrooms with sleeping accommodations for up to 14 guests. The main level has a 1/2 bath next to craft room. Also, on the main level there is a master bath with Jacuzzi tub and separate shower. The upper level has a full bath. The lower level has a 3/4 bath. Towels & soaps are provided. *The recreation/game room located in the lower walk-out level has a TVw/DVD & DIRECT TV service as well as a stereo system with surround sound. This area has a pool table and a wide selection of board games. Also, a bar, game table, microwave, mini-fridge and fireplace. *Relax, Refresh, Renew in our massage room filled with soothing music and fragrant candles & heated blankets. NEW:exercise area with Elliptical, treadmill, stationary bike work-out/YOGA DVDS--Bring clean gym shoes for a great work-out. 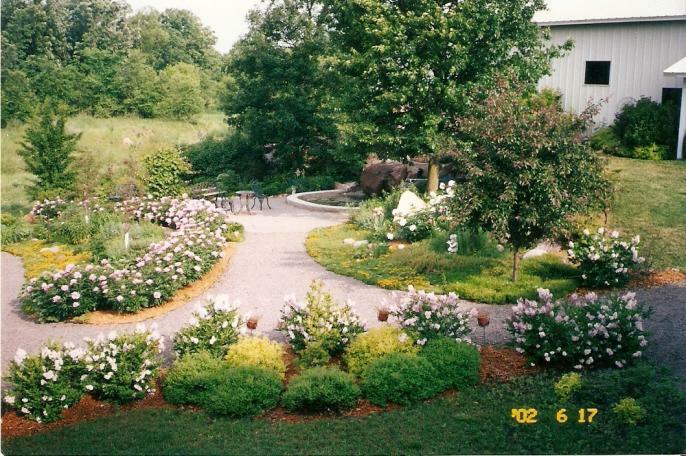 For our summertime guests be sure to take time to "smell the roses" as you enjoy the outdoors either on the wrap around deck or patio area complete w/grill included for your use and be sure to stroll through the gardens and courtyard.